These look typical and convincing. However, they have been altered in the simplest possible way. 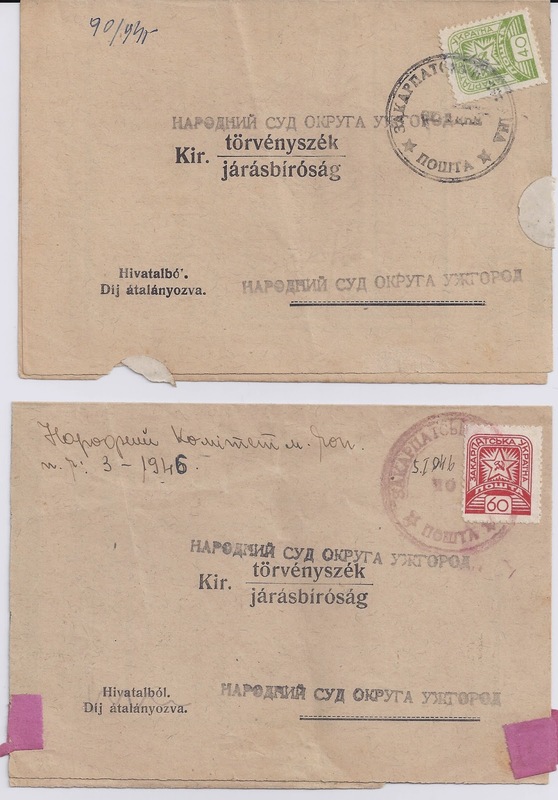 These documents date from the end of 1945 (26 XII 945 on the inside of the item with the green stamp; 5 I 946 in manuscript inside the reddish-violet cancellation). By this time, Soviet stamps had replaced the local issues and these two items were probably franked with 30 kop Airman stamps of the Soviet Union - examples can be found though they are not so common as items with Carpatho-Ukraine stamps. Or these documents may have been stampless. The Carpatho-Ukraine stamps are easy to find in mint condition; they have been added to these documents (maybe after removal of a Soviet stamp, maybe not) and the cancellation over the stamp completed using .... PENCIL. Nothing more sophisticated than that. It would be necesary to lift the stamps to see whether a stamp was removed or whether the items were originally stampless. I haven't done that. I just like the cheekiness of the forger who very nearly succeeded.